See, I told ya I’d be spending time at this guy’s site! 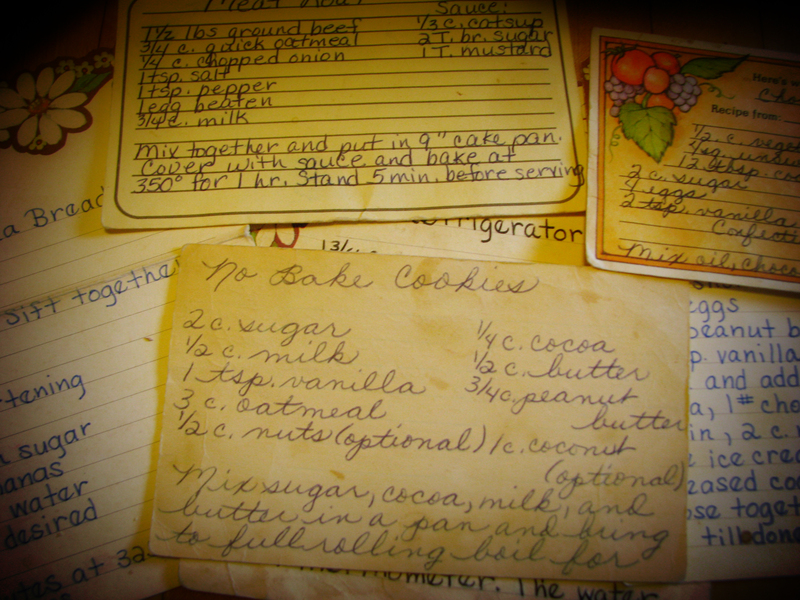 One thing he’s got going on, that is near and dear to this little antique-cookbook-collecting soul, is a project to locate and rescue old recipes. While many of the oldies are simply no longer feasible, many are true oldies but goodies. 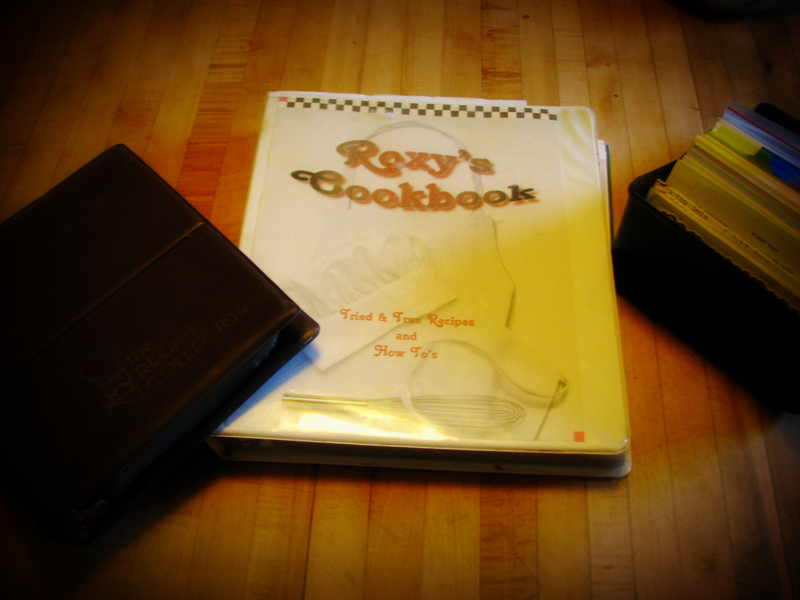 There are dozens of various oldies in that box and I happily added it to my collection of home-grown cookbooks. A wealth of culinary imagination! The one on the left of the pic is a family collection, the box on the right is the one I found, and the one in the middle – well, I’ve been putting that one together for the last… well, a long time. And it’s absolutely full of great stuff. Sure, I have most of my recipes typed up and in digital format, tagged for easy sorting and locating by ingredient and all that. 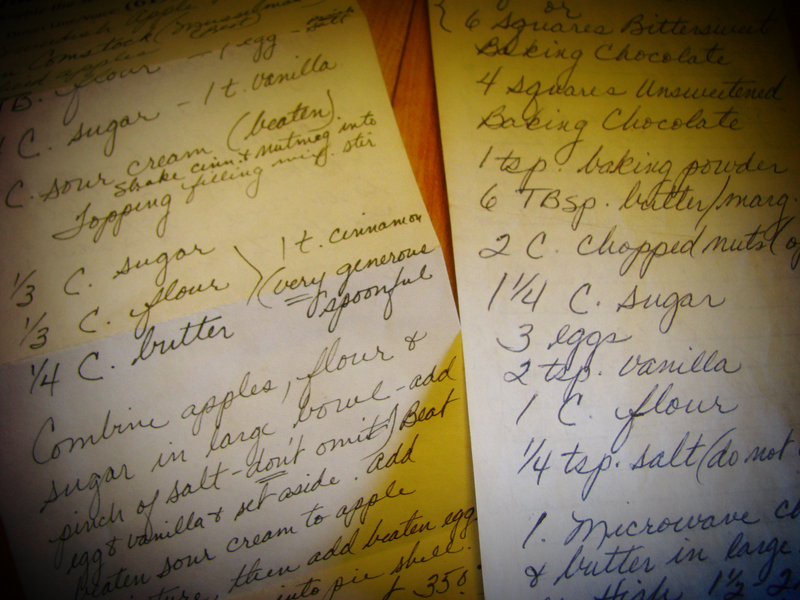 But there is something just… charming about the handwritten recipe. Don’t believe me? Well, in putting together a nice, neat, typed up, digitally formatted cookbook, I almost threw out some old handwritten pages, thinking them obsolete. And that was her quick, “messy” handwriting! The point is, those quickly scribbled sheets take me back, and bring with them a flood of memories. And so they stay. The recipes have been typed up, modified a bit and perfected, but these little scraps still mean something to me. My own collection has a mixture of everything from handwritten, to clippings with notes scribbled on them, to typed up sheets. And I’m leaving it that way. Why? Because some day, when I’m long gone, I hope the strange collection that shows the evolution of my cooking (and my penmanship) over the years and includes little notes and thoughts, I hope it will bring my kids the same kind of happy memories that seeing my mom’s handwriting on a slip of scrap paper brought me. Memories of good times, in her bright, warm kitchen, surrounded by the smells of good food, the business of meal time preparations, and lots of love and laughter.